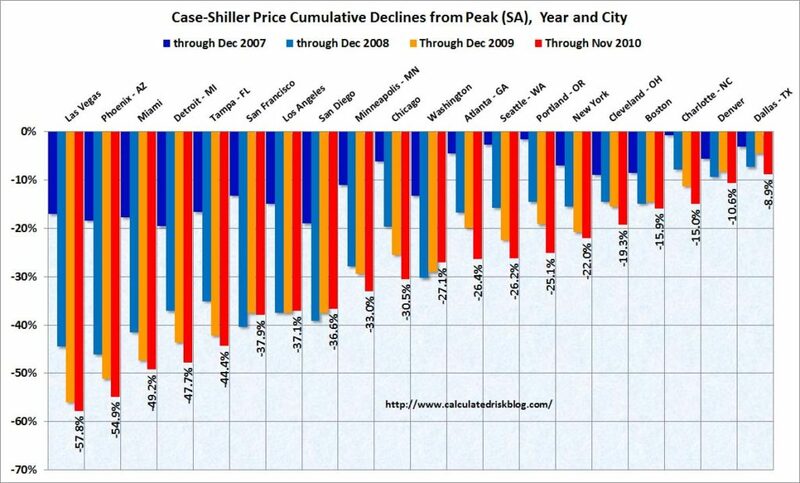 Atlanta, Charlotte, Boston, Denver and Dallas were the cities that fared relatively well when the US housing bubble went bust: housing prices in these cities, until 2010, had only declined 10-20%, much better than the 50% average price drop in cities like Phoenix, Miami and Las Vegas. But the recent price trend is worrisome: prices in these markets started to decline, sometimes at a faster pace than national average. The extreme example is Atlanta. Last year, the price in the southern city dropped 12%, the largest yearly drop among all major cities. (see the dynamic chart below, from NYT). It remains to be seen whether the price dropping in these cities will pick up and eventually catch up with the national average. The key focus lies on how soon the labor market is likely to recover. Without jobs and robust income growth, more people will be forced out their homes, which will lead to another round of price decline. Folks at CalculatedRisk also have a very nice chart showing the cumulative housing price declines by cities. 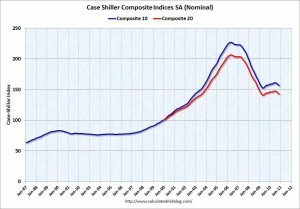 The latest housing price, as captured by the Case-Shiller Index, continued to fall in October. Here are two sharp charts from Calculated Risk. Combined with latest sales figure, the inventory of existing home sale, after a faked jump due to government’s incentive program, seemed starting to move again. 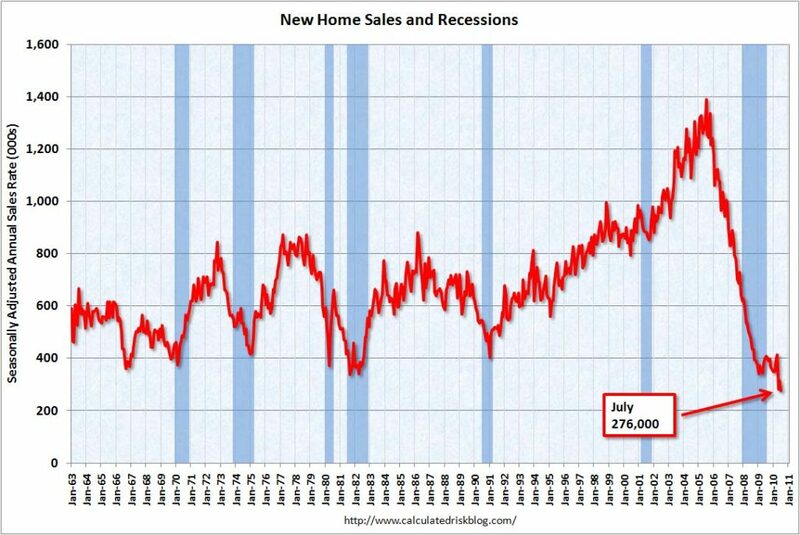 However, the new home sale is still very much depressed. 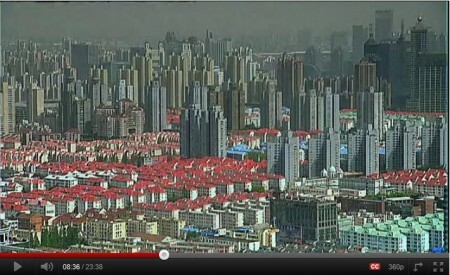 According to PNC’s Stuart Hoffman, 2012 will be a transition year for the housing market. The hope is that the gradual fall of the housing price may eventually clear the inventory, six years after the last housing peak. If the economy turns weaker in 2012, the Fed may eventually be forced to buy more mortgage-backed securities. However, the likelihood of any household debt relief program is dim, considering the current fiscal situation. In 2012, we are likely to see a continued muted growth in the US. Now people began to appreciate the importance of housing in driving business cycles. 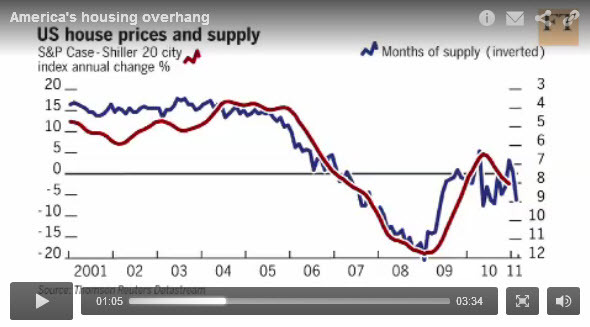 Without robust recovery in US housing market, any talk of V-shaped recovery only sounds foolish. America’s housing recovery is still mired in a long slog. 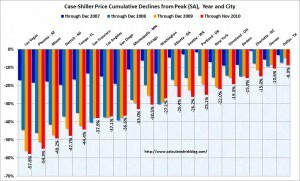 As of Nov. 2010, housing prices declined in all major cities except for Los Angeles, San Diego, and Washington DC. See the chart below (courtesy of CalculatedRisk). 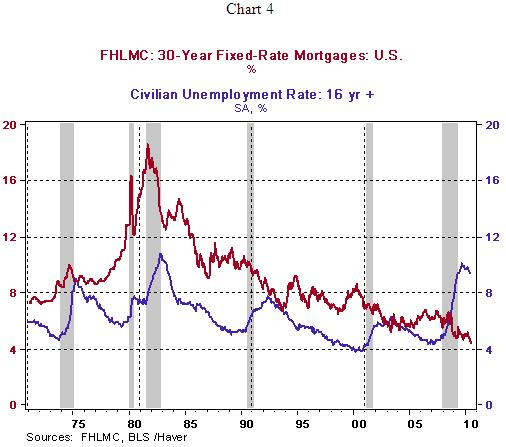 It seemed that the earlier government’s home buying credit stalled the normal housing market correction. Now the law of physics kicks in again. As a side phenomenon, the housing woe fuels a surge apartment rental market. 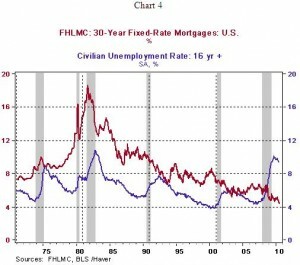 The slow recovery in labor market and the direction of housing price are the major culprits. People rationally substitute rental for owning a house – which tends to create a negative feedback loop and dent the housing price further. WSJ reports, with millions of families switching from being homeowners to renters, apartment-building values have soared. Investor demand is so intense, prices of some properties are approaching values last seen in mid-2007…Values of apartment buildings rose 16% in 2010, according to brokerage firm Marcus & Millichap, after falling 27% between 2006 and 2009. When I moved out of Boston in the summer of 2009, the apartment rental market was quite dismal. I spent a few month trying to sublet my apartment and eventually I took a hit of at least 20% . But now the fortune reversed. In a longer term perspective – after a big bubble, it’s no longer profitable to use housing as an investment. Or you have to be very very patient. Buying a house will just be buying a house; don’t expect to make money by flipping it. No more. 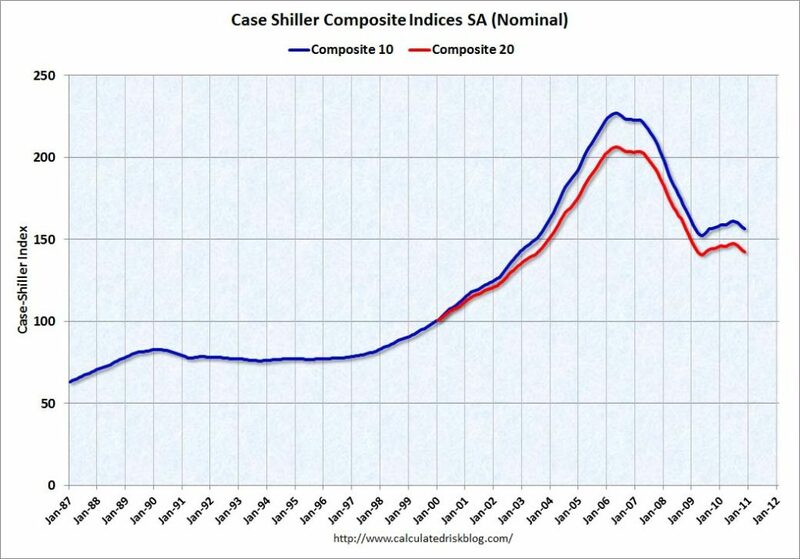 Here below is a long-term housing price chart, from Bob Shiller. 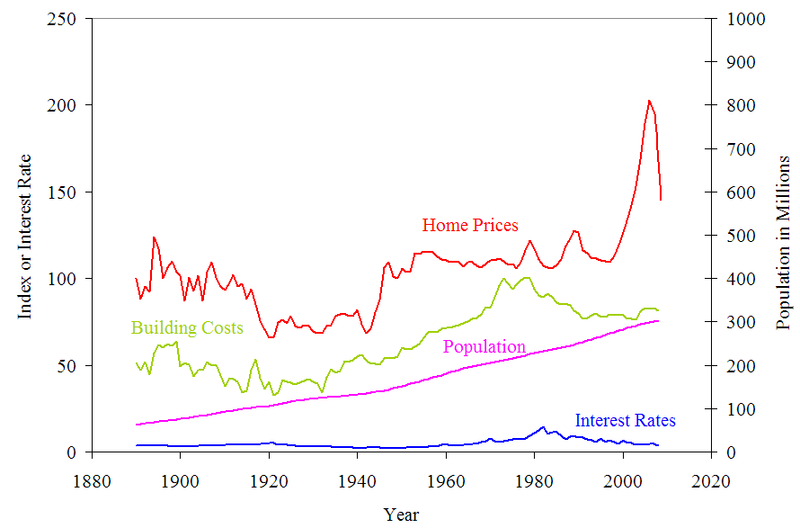 It’s quite telling: you can see the recent housing bubble was really an anomaly by historical standards. Finally, I included an interview by Bob Shiller at Davos, Swiss. He gives you an update on his view on the housing market trend. Value investing conference hosted at Darden Business School of UVA. Some nice big-picture views of the current economy. Pay attention to the interesting analysis on housing market – among the 56 million US residential mortgages, it’s estimated that 20% of them, or 11 million, will eventually default. Housing price is set to decline by another 5% at least; if without government support, probably by 10%. 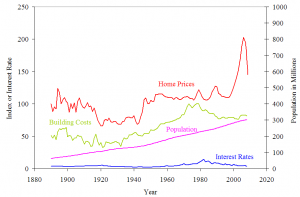 What year have housing prices corrected to? By cities. 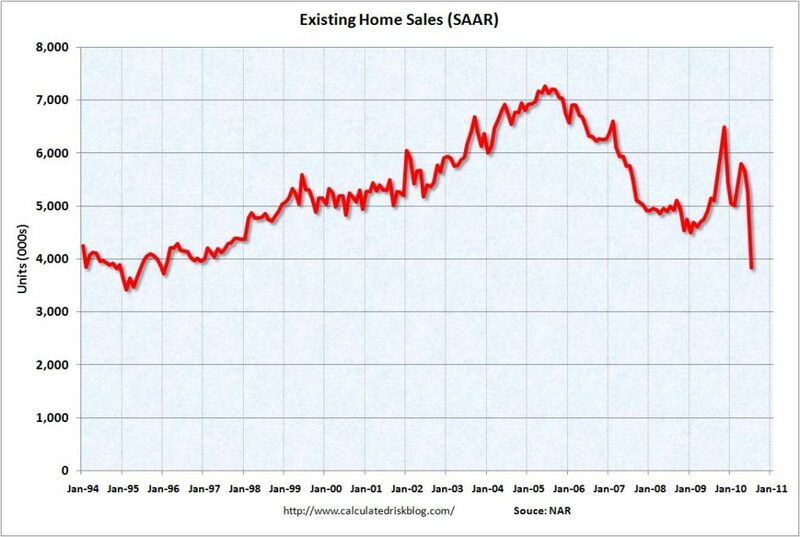 and existing home sales reached the lowest level since 1996. After the expiration of home buying credit, this was expected. But the magnitude of decline still shocked people. 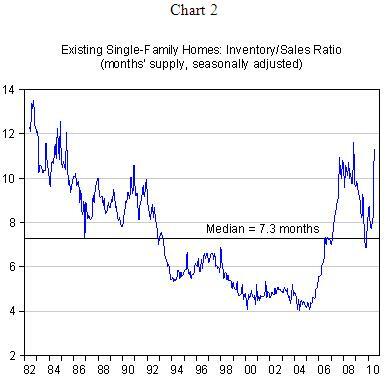 Due to slow sales, inventory of unsold homes starts to ramp up again. 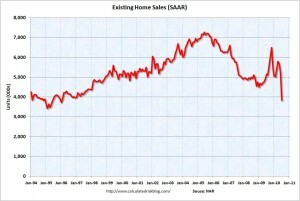 And this is happening despite historically low mortgage rate. Two things might be working against potential home buyer’s psychology: 1) Is my job secure? 2) Will the house price keep falling?